I’ve read almost everything Charles Martin has available. Chasing Fireflies is my favorite, and I shared what it taught me in a previous post. 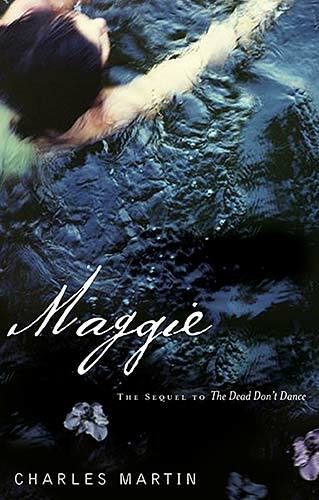 Maggie is his second novel – a sequel to The Dead Don’t Dance – and I enjoyed it as much as I’ve enjoyed his other stuff; Mr. Martin just writes good books. If you haven’t read him, I started with When Crickets Cry and haven’t looked back. He writes with warmth and depth of emotion, but also with masculinity and some good old-fashioned action as well. Which leads me to the first thing this book drilled home. 1) You can write a book that resonates with both men and women. In this era of hyper-specific genres, it’s tough to find a book two differently interested people will enjoy. A book must either be violent, crass, and lewd in an effort to appeal to some form of male, or it must be sappy, conversational, and melodramatic to appeal to some form of female. (Sorry for the generalizations, but I think you know what I mean.) But in this book, along with Martin’s other works, my wife and I have found an author we both enjoy, and books we can appreciate for distinctly masculine or feminine reasons. I think it’s awesome, and it gives me hope. If I ever get around to novel writing, I’d like to think I would produce similar stories. I would love to write stories that aren’t afraid to delve into the deepest parts of us, but also aren’t afraid to include a good chase scene through a swamp with an ex-Navy Seal. Martin pulled it off in Maggie and taught me I might be able to do the same. Neither my talent nor perseverance got this book in your hands.. I’m neither that good nor that strong. The miracle of our story is not me. It’s a girl who, with a single kiss and six words, reached down beyond my fear and doubt, down where my love lives, and gave me a gift — she stood beside me and believed. Those six words were, “You’re not a reject to me,” and I have a wife who would say the same to me. So maybe I can keep at it too. By the way, if you are a fan of Charles Martin, you might enjoy this interview I found. A son, a brother, a husband, a father of eight, and a friend. A follower of Jesus Christ. A fan of the Seminoles and all teams Atlanta. I write, I read, and teach when I can. I prefer red pens. I'm easily distracted. I've lived in Augusta, GA, northern Minnesota, the beautiful western NC mountains, and Tallahassee, FL - Go 'Noles. I played football for FSU, was on the national championship team in 1999, and took a few snaps with the Pittsburgh Steelers. My favorite colors are fluorescent yellow, and Garnet & Gold. I drive a minivan and think it's cool. This entry was posted in What I learned, Writing and tagged Charles Martin, Maggie, The Writing Process, Writing Routine. Bookmark the permalink.